Indrajeet Sharma (Inder) was born in Bulandshahr, Uttar Pradesh, India. He received his M.Sc. degree from Indian Institute of Technology, Kharagpur in 2006 where he worked with Professor Dipakranjan Mal studying Hauser Annulation reaction for the synthesis of anthraquinones. He then moved to the United States for his PhD degree. He began his PhD studies in glyopeptide chemistry with Prof. David Crich at the University of Illinois at Chicago, and then moved with him to Wayne State University in 2007, where he completed his degree in 2011. After a post-doctoral position at Memorial Sloan-Kettering Cancer Center with Derek S. Tan, he began his independent career at the University of Oklahoma, Norman in 2014. His research focuses on the development of new synthetic methods based on metal-carbene chemistry and their applications in total synthesis and drug discovery. The impact of his carbene chemistry has been recognized as a recipient of Doctoral New Investigator Award from the American Chemical Society as well as a recipient of the 2018 NSF Early Career Award. From Chennai, India, Arun obtained his B.Sc. and M.Sc. from Guru Nanak College. The he worked as a research associate in Syngene, Bangalore for two years. He then received CSIR-SPM fellowship and moved to IIT Madras where he worked on carbene-mediated chemistry and obtained his Ph.D. under the guidance of Prof. G. Sekar. 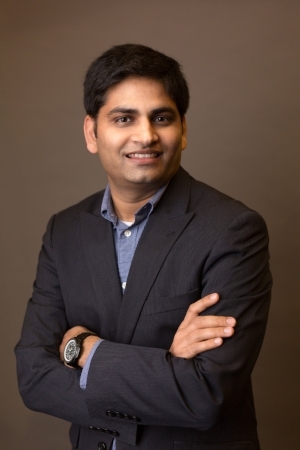 In 2019, he joined the Sharma Laboratory as a Post-Doctoral fellow. His favorite thing about OU is the beautiful campus. Random Fact: Arun loves to cook while watching his favorite movies. From Clintonville, NY, Nick obtained his B.A. and M.Sc in Chemistry at SUNY Oswego under Dr. Fehmi Damkaci. After graduation, Nick joined the Ph.D program at OU in 2014. His favorite thing about The University of Oklahoma is the beautiful campus and the kindness of the faculty and staff in the Chemistry department. His favorite hobby outside of lab is training for Titan Martial Arts in Norman. Random Fact: Nick was a NCAA Division III Wrestler and an amateur MMA Cage Fighter. Originally from Penfield, NY, Steven moved to Beavercreek, Ohio in 2011. He then obtained his B.Sc. in Chemistry at Miami University in Oxford, Ohio under Dr. Benjamin Gun. Steven joined the Ph.D. program at OU in 2015. His favorite thing about OU is the friendly culture and the tailgate events CBR organizes. His favorite hobby outside of lab is playing the electric guitar as loud as possible and relaxing with his soon to be wife, Bre, and two dogs, Pickles and Dig. From The Bahamas, Anae traveled to the US to obtain her B.Sc. in Chemistry at Taylor University under the advisement of Dr. Dan Hammond. After graduation she joined the Ph.D. program at OU in 2017. Her favorite thing about OU are the facilities because they help foster a productive work environment. Anae wishes she had more hobbies but her favorite pastime is watching cartoons. Random Fact: Anae is a classically trained pianist and has been playing for 14 years. Originally from Madhya Pradesh India, Aayushi got her BSc/MSc dual degree from IISER Bhopal where she worked on fluorescent probes in Dr. J. Sankar's lab. Aayushi then traveled to the US to join the Ph.D. program at OU in 2017. Her favorite thing about OU is the cultural diversity and beautiful campus. Her favorite hobby outside of lab is sketching/painting and watching movies. From Rochester, NY, Adam earned his B.S. in Chemistry from Saint John Fisher College in 2018 under the advisement of Dr. Kevin Callahan. After graduation she joined the Ph.D. program at OU in Fall 2018. Her favorite thing about OU are the faculty members and the friends he has made. His favorite hobby outside of lab is gaming. Random Fact(s): Adam is a dual citizen of the United States and Switzerland, he can speak French, and he knows how to play the harp. From Oklahoma City, OK, Ib joined the Sharma Lab during his sophomore year at OU. He is currently majoring in Biochemistry with a minor in Spanish. Before coming to OU he attended Classen School of Advanced Studies in Oklahoma City. His favorite thing about OU is the opportunity to receive a great education close to home. Outside of lab he enjoys playing soccer and running. Random Fact: Ib was born left handed but switched to right-handed as a child. From Fayetteville, AR, Monica joins the Sharma Lab during her junior year at OU. She is a Chemistry major and minor in International Studies and Environmental Science. Prior to joining the Sharma Lab, Monica participated in research in the College of Engineering. Her favorite thing about OU is that there is always something to do around campus. Outside of lab she enjoys doing outdoor activities like backpacking and camping. Random Fact: Monica can play the drums. From Kansas City, Kansas, Sabrina joined the Sharma Lab during her sophomore year at OU. She is currently studying Chemical Biosciences and Letters. During the summer of 2017, she attended the Organic Chemistry in Arezzo Program through the College of Arts and Sciences. Her favorite things about OU are the incredible people she has met and the amazing opportunities for learning and growth. Outside of the lab she enjoys going to the movies and drinking coffee. Random Fact: She used to dance ballet and be en pointe!